Students and higher education experts said the lack of a traditional dining hall can cause students to run out of dining money quicker than those at other universities, leading to skipped meals and an added strain on already-tight budgets. When officials announced in spring 2016 that Foggy Bottom’s long-loathed dining hall would shut down, allowing students to spend dining money at vendors across the District, many applauded the decision. But more than a year into the new plan, students say running out of GWorld dining cash before the end of the semester is still the norm. Students and higher education experts said the lack of a traditional dining hall can cause students to run out of dining money quicker than those at other universities, leading to skipped meals and an added strain on already-tight budgets. 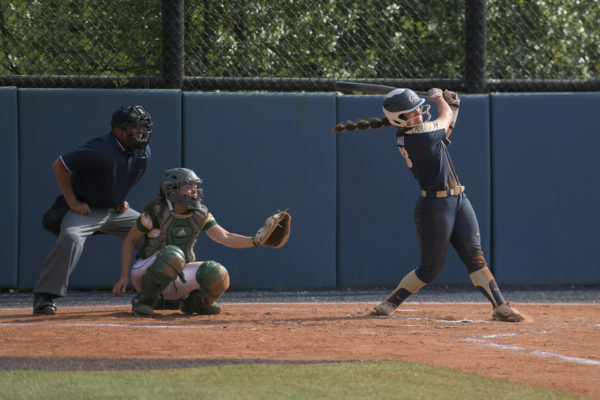 “I had to explain to my parents that I need food to survive, but I have no money for it, and they were like, ‘oh, you’re screwed,’” senior Katie Dillon said about running out of dining dollars nearly every semester she’s been at GW. Officials said the new dining plan was crafted after students “overwhelmingly and consistently” pushed for a more flexible plan that would allow students to take advantage of a booming restaurant scene in Foggy Bottom. The University closed its only traditional dining hall – J Street – in 2016 after student leaders complained the hall provided lower-quality food for the same price as outside vendors. Still, affordability has remained a major issue and University spokeswoman Maralee Csellar said officials are reviewing the amount of dining dollars that students are required to buy with each of the dining plans. “We also want to be sensitive that the amount a student may need will depend upon the student’s schedule, eating habits, whether they have a meal regularly off-campus and the extent to which they prepare their own food,” Csellar said in an email. With 110 days in the fall semester, not including the five days of Thanksgiving break, freshmen have about $18.64 to spend each day in dining cash, sophomores $12.27, juniors $10 and seniors $5.45. All students who live on campus are required to purchase a dining plan. The average price of one meal at some GWorld merchants can be higher than the amount that students have allocated to spend daily. Amid affordability concerns last spring, officials added $200 to each dining plan. Students or parents can reload money onto their GWorld cards at any point throughout the semester. An average meal at Burger Tap & Shake can run a $12 to $14 bill, Kathy Arvis, the marketing director for the operator of the restaurant, said. GCDC has an average dinner price of $15, owner Bruce Klores said. In interviews with more than 25 students who ran out of dining dollars last academic year, students said paying for a sufficient meal each day is an added stress on top of schoolwork and jobs. Sophomore Sarah Stupp ran out of dining dollars around three weeks before the end of the spring semester last academic year. She made it through the first semester without running out but said she found herself eating only one meal per day. “I probably lost about 10 pounds because I wasn’t eating as much, because economically I couldn’t and also because I’m stressed and instead of stress eating I stress didn’t-eat,” she said. Cooper Stouch, a junior, said he has run out of his dining dollars every semester he’s lived on campus. He said he tries to budget his money, but it’s “impossible” to live in the District and eat three healthy meals each day without running out of GWorld money. Officials said incoming students, who often have no prior experience living on a budget, may not know how to wisely spend dining dollars, especially with the amount of options available near campus. 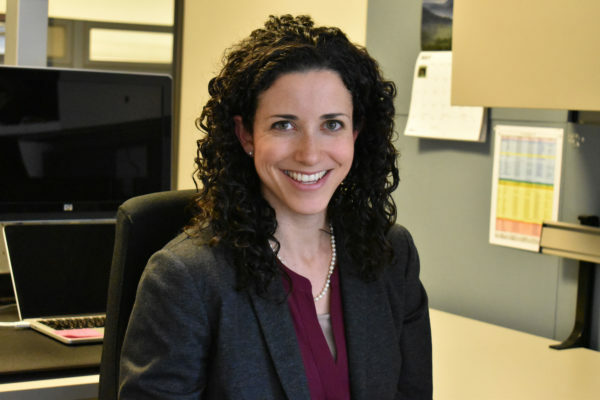 Csellar, the University spokeswoman, said GW created four meal-planning profiles for the dining website in 2016, offering suggestions about how to grocery shop on a budget and spend money at local vendors. She said officials will also extend the feature this spring to include sample budgets from GW Dining’s student representatives, who were introduced earlier this semester to offer meal tips on Twitter for students with dietary restrictions. D.C. now has one of the highest costs of living of major cities in the U.S., recently clocking in at No. 10 on the Council for Community and Economic Research’s list of the 10 most expensive cities in America in May. Csellar said the new dining plan was built so that dining dollars could roll over to the next semester, which often isn’t the case at other universities that require students to purchase set amounts of meals at the beginning of the semester and don’t give refunds for unused meal money. Kevin McClure, an assistant professor of higher education at the University of North Carolina at Wilmington, said students often struggle to budget dining dollars and many parents, who are already paying steep tuition bills, can’t afford to add more funds to meal plans. “A problem with this idea of you all taking your student ID cards and using that as the basis of your currency to live on is that when you’re using your ID card, it doesn’t feel like it’s real money anymore,” he said. While students struggle to budget GWorld money, the University takes a cut of all purchases made on GWorld, according to five campus dining partners. Store owners confirmed that the University takes 10 percent commission from all GWorld sales and charges vendors $40 per month to use GWorld card machines. 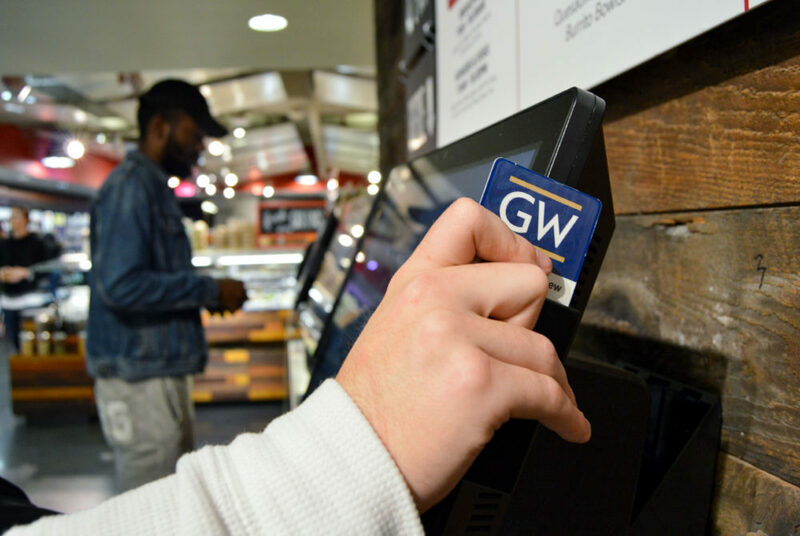 The University enrolls roughly 2,500 freshmen annually, and for the freshman class alone, each student receives $4,100 in dining dollars for the year – giving GW the potential to earn more than $1 million from swipes off first-year diners. Csellar declined to comment on any financial relationship between the University and its dining partners. Earlier this year, University President Thomas LeBlanc said the open dining program as it stands may not cover the cost of eating in the District. Csellar said examining the dining program is part of LeBlanc’s effort to improve undergraduate student satisfaction and that his office has been involved in conversations about new vendors and student spaces. Last fall officials started a “Meal Deals” program giving students the option to purchase $6, $8 or $10 meals at select dining partners. James Dubick, the director at the National Student Campaign Against Hunger and Homelessness, said when students aren’t given enough to cover the cost of eating, they often have to shell out more of their own money to afford to eat, putting lower-income students at a disadvantage. “The danger in the meal plan that doesn’t offer you three meals a day essentially is that it leaves students in a situation where they have to fill the gap,” he said. Last fall, the University opened its first campus food pantry, The Store, giving students struggling with food insecurity the chance to anonymously receive food donations. Officials have insisted that The Store was not created in response to any GW-specific issues, saying that food insecurity is an issue at college campuses nationwide – including at rural universities and community colleges. Sarah Sem, the president of The Store, said she is unsure whether GW’s city location contributes to the number of people who use the pantry – this academic year there are more than 500 – but that food pantries are prevalent at universities nationwide.